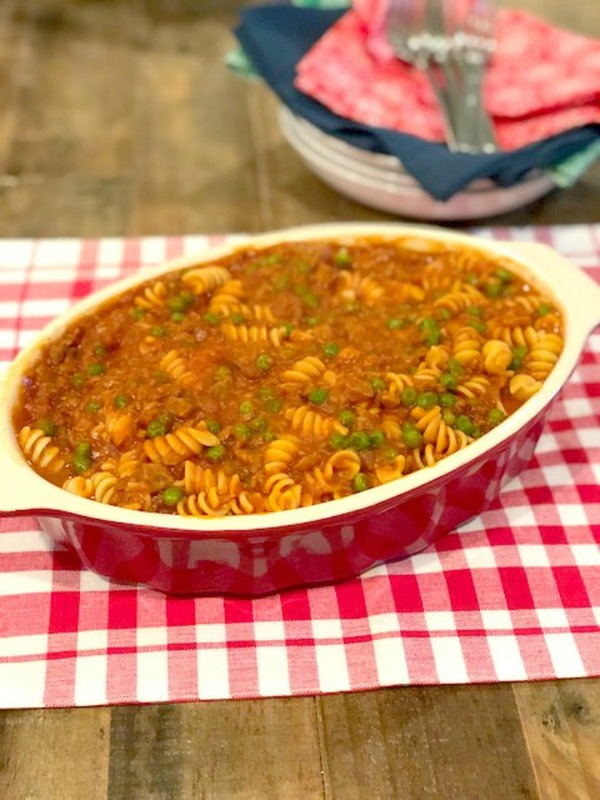 This easy-peasy recipe for American Chop Suey has been passed down for years. We all love how comforting this recipe is and how simple to throw together. The mild tasting sauce from tomato soup gives this a most wonderful tasting dish. Enjoy every last bite! This delicious recipe has been in my family for years. There are so many versions around, but, we love this simple and easy one. Only a few ingredients and you have a wonderful family meal that everyone will love. I used ground beef this time but ground turkey and chicken work great too. Serve with a favorite vegetable and salad for a well rounded meal. 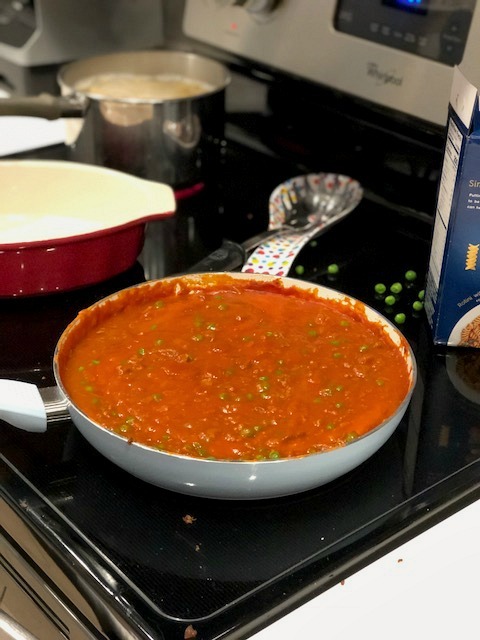 Or, add in some peas like I did for this recipe and enjoy with a big crusty bread to sop up every last drop of the yummy sauce. 3 10.5 ounce cans tomato soup or a large 26 ounce can and 1 small can. If you like it really creamy, add more! Preheat oven to 350 degrees, have a large oven proof casserole dish misted with cooking spray and set aside. Boil pasta as per package instruction. When finished, drain, put back in pot, cover with foil until ready to use. 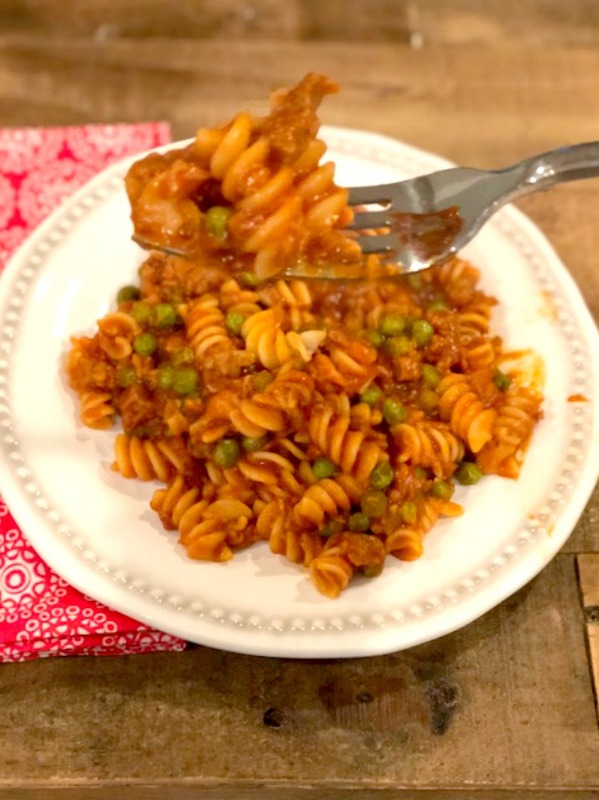 In a large non stick pan, add a teaspoon of olive oil or mist with cooking spray, add ground meat and break up any large pieces while cooking over medium heat. Add salt, pepper, onion and garlic powder. Keep cooking until meat is completely cooked. Drain off any added fat. If using peas, add now and stir to heat up. Add tomato soup into pan, Do Not Add Water mix around until all the meat is coated and looks creamy. Now carefully pour into pot with pasta. Mix gently and either pour into a serving dish or place in oven for about 15 minutes. Take out and let sit for 5 minutes and serve up. Enjoy this warming and comforting meal!